This is a new sticker on the window of my local Barnes & Noble, a store I worked at when it first opened over fifteen years ago. 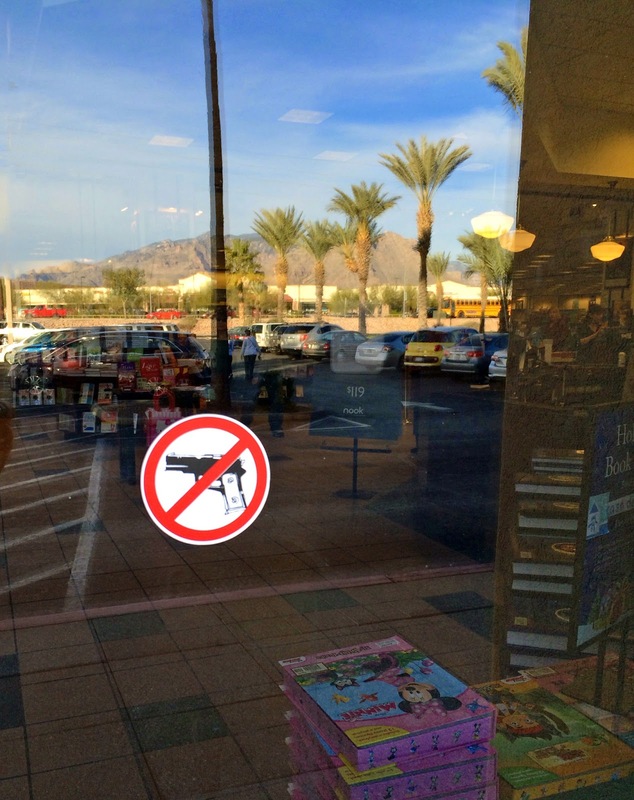 I spend a lot of time in this store, and I can't believe they have to have a "no guns" sticker on the window. It's a little creepy. Other than the occasional group of weirdo teenagers walking through after the movies, this is a pretty quiet store, and it's in a good neighborhood. The cafe is typically filled with old people, students, and people like me who just get a coffee to accompany their stack of magazines. I don't really know what a sticker like this accomplishes. I'm pretty sure the guy with the gun isn't going to say, "Oh, crap. Did you see that sticker? I can't go in there with this gun." And unless they're frisking everyone who walks through the doors (which we weren't), how do they even know who has a gun? Crap. How am I going to concentrate on my magazines if I now have to look over my shoulder while I'm sipping my latte?